The guest room has been painted and I am very pleased with the results. We chose 2 grays; a lighter shade for the main walls and a deeper shade gray for the accent wall. 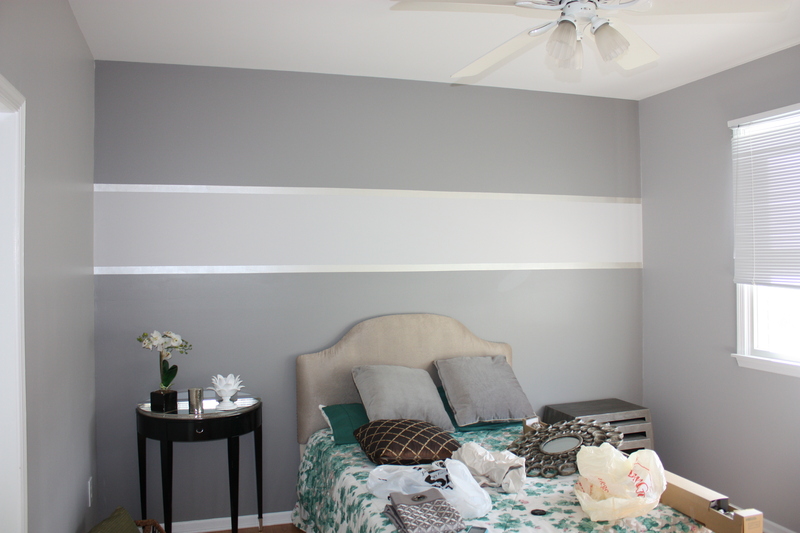 The wide stripe carries over the light gray from the main walls with 2 thin silver stripes adding a little bit of glamour and luxury to the room. As you can see the new headboard has been installed and the room is now ready to be styled with curtains, new bedding, and accessories. We are trying to decorate the room on a budget, so that requires a little bit of flexibility in the design, as well may take a little bit longer shopping, as we do not want to compromise on quality and design! 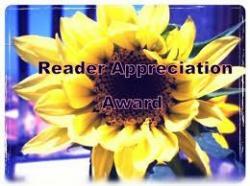 Categories: DIY, Interior Design & Decorating | Permalink. 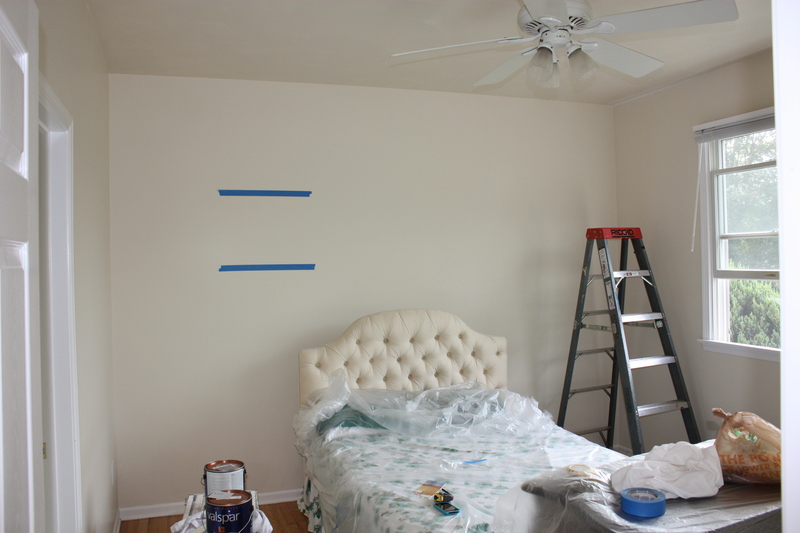 A guest room (see before picture below) that we are currently working on is receiving a new headboard. 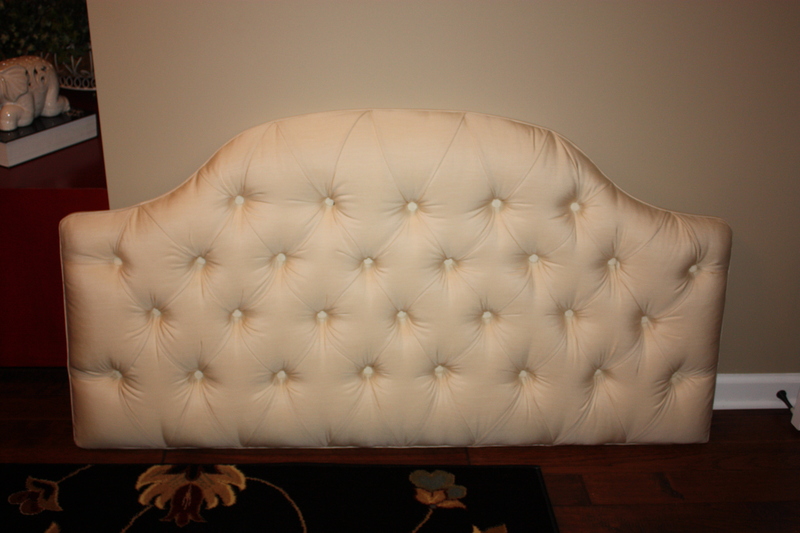 The old headboard featured nice tufting but was made with a very inexpensive muslin type fabric. We wanted a higher-end, cleaner and more modern look for the new guest room! Step 1 – Remove old headboard. 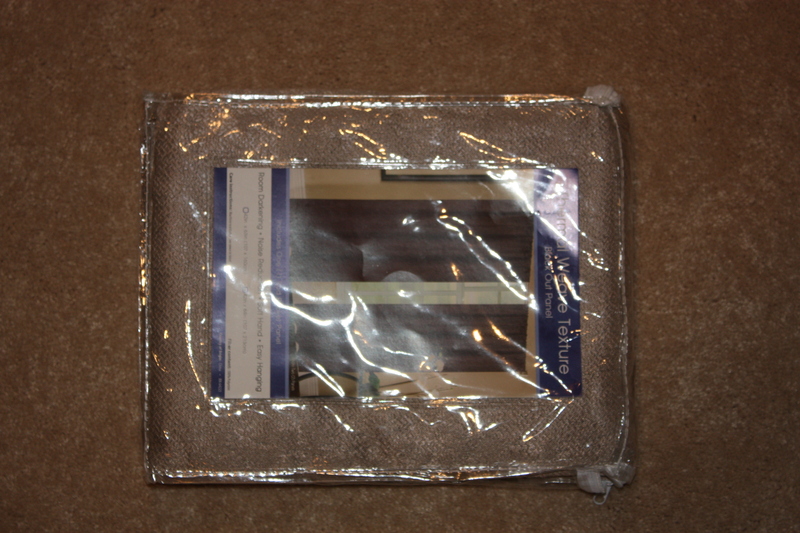 Step 2 – Purchase new fabric. Actually instead of buying yardage, we found a curtain panel at the Christmas Tree Store for $9.99 in the exact color that we were looking for. 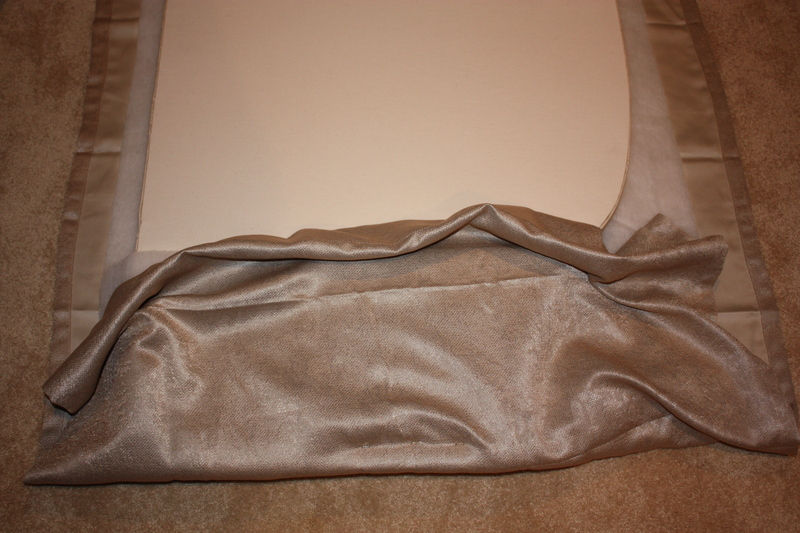 Since it was a thermal lined curtain panel it also had the right “weight” to be used for this upholstery project. 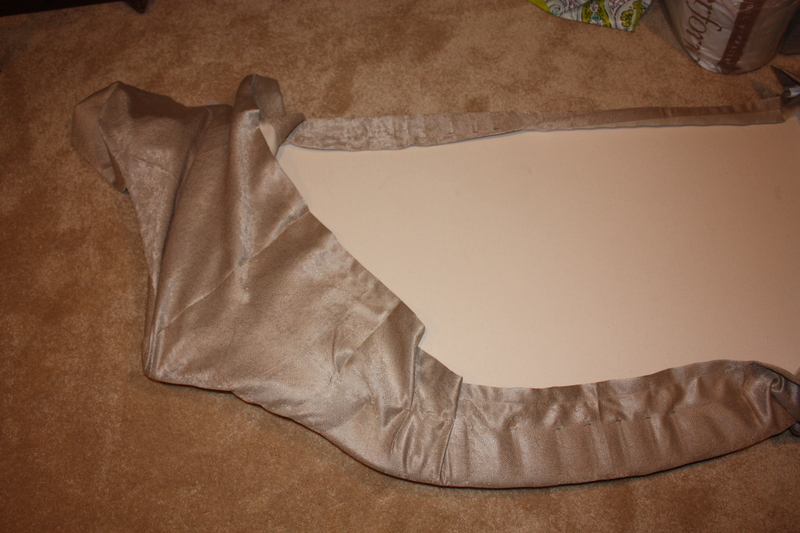 Step 3 – Lay out the fabric (face down), add a thin layer of padding, and place headboard on top, face down as well. Step 4 – Start stapling! It’s best to use a helper for this to make sure that the fabric is evenly stretched in order to avoid any wrinkles and to make sure that the direction of the fabric and the headboard are the same. 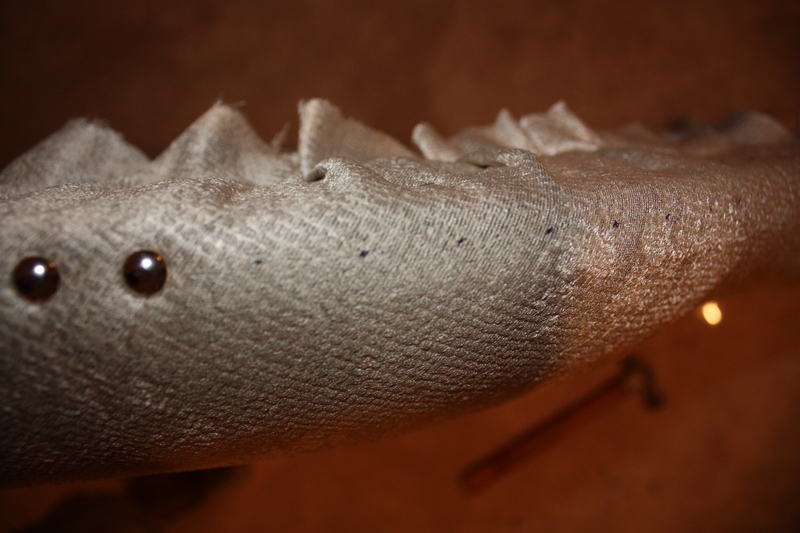 Step 5 – We decided to add nail heads as well, which we purchased at Lowes. 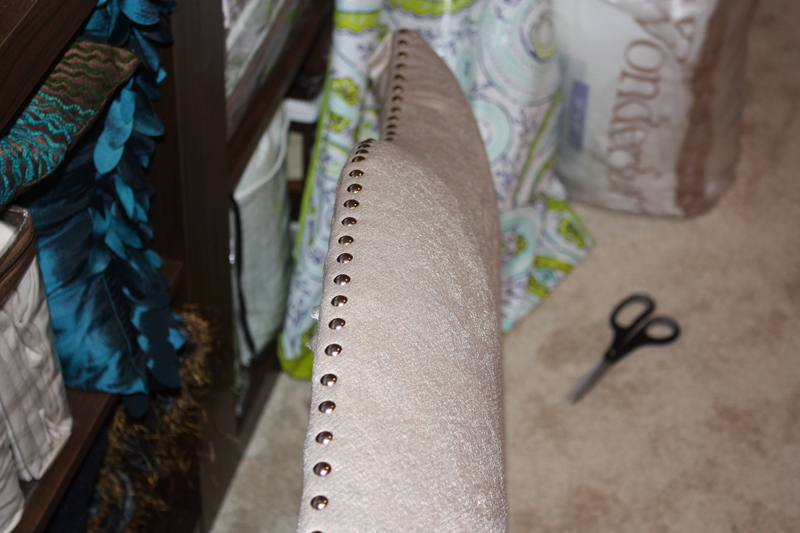 Step 6 – Make sure the nail heads are evenly spaced and in a perfectly straight line. Our nail heads are 3/4″ apart. We measured first and marked each spot with a very fine black sharpie. And enjoy your new head board! Want to see the finished bedroom? We will post pictures of the finished room in a few weeks! Step 4 – Staple away! 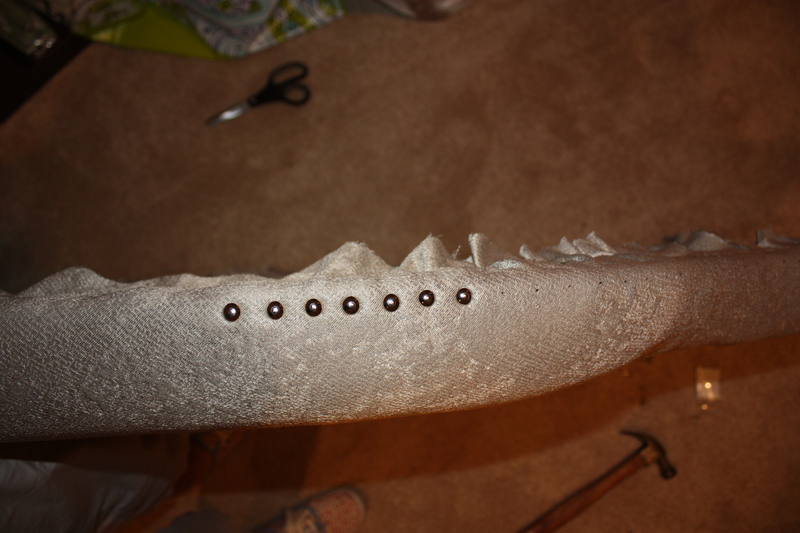 looking from the side as you work to keep nailheads straight! 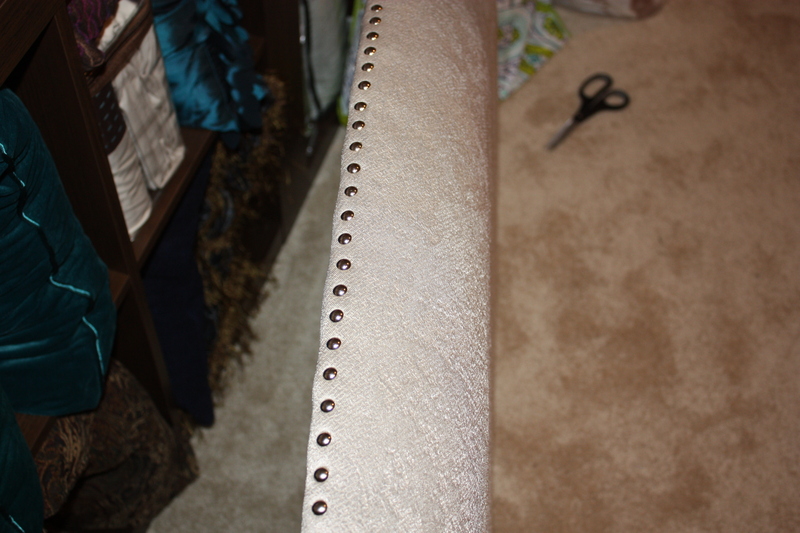 Categories: DIY, Interior Design & Decorating | Tags: bedroom makeover, DIY headboard, easy, guest room makeover, inexpensive, modern, nailheads | Permalink.